I entered this Thanksgiving not sure what to expect - it was the first time in the past couple of years that I wasn't cooking dinner, which I was admittedly a little sad about, but it meant that I could just sit back and enjoy the holiday instead of rushing around the kitchen all day. I enjoy both perspectives of Thanksgiving, so this was definitely a nice change of pace. 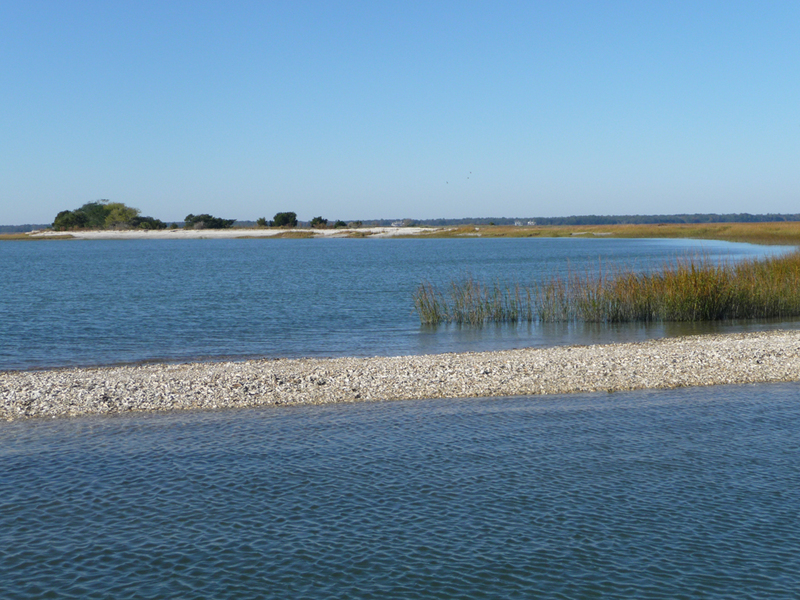 Our plan was to go to Hilton Head Island, SC, and spend Thanksgiving with some of wifey's relatives. During dinner, while manning an impromptu deep frying of a turkey (which turned out pretty awesome in its own right), I was offered to join some guys on a fishing trip in the inlets around the lowcountry. I have never been fishing before, and the offer was really too good to pass up: go fishing for a few hours with an avid local fisherman named Graham who would take us to his favorite spots to fish for Redfish (or Red Drum). 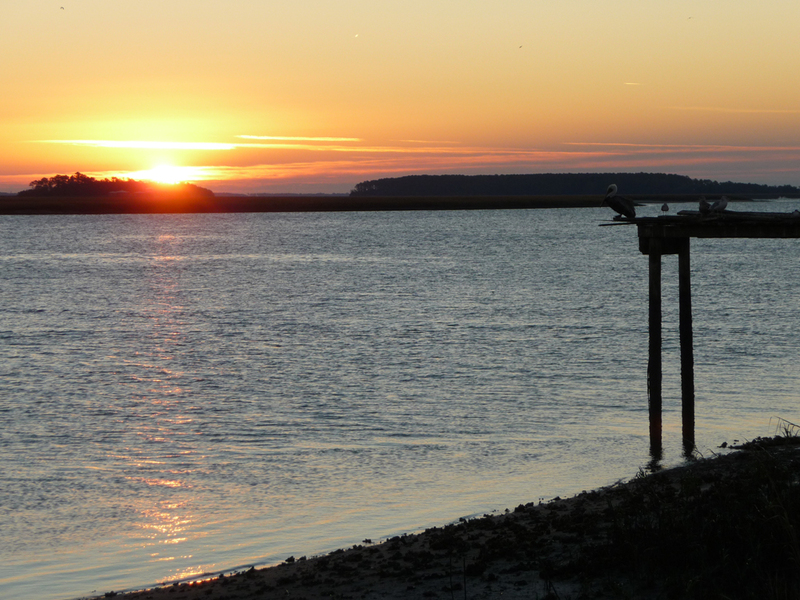 We woke at dawn on Saturday morning and headed out to meet Graham at a marina on Lemon Island. Graham already had the boat in the water when we got there, so we immediately headed out to try to catch the Redfish during low tide when they would be feeding. I was really impressed with Graham's method of fishing. 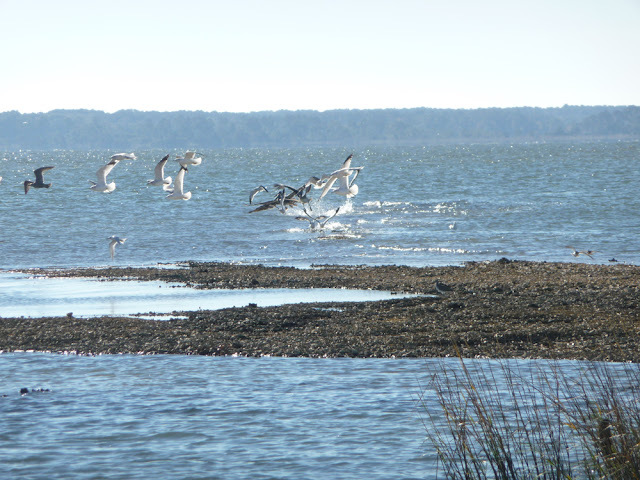 We would motor to a specific spot where he suspected the Redfish would be gathering. 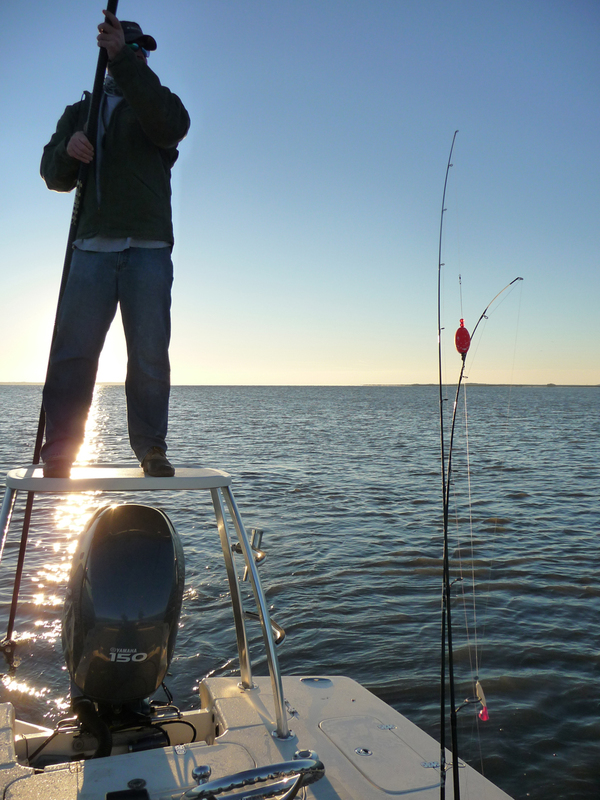 He would then turn off the engine and use a long push pole to push us from spot to spot to refrain from scaring the fish away. He would stand on a platform above the engine of the boat and look for perturbances in the water and then push us towards those spots, while we casted in the directions that he told us to. 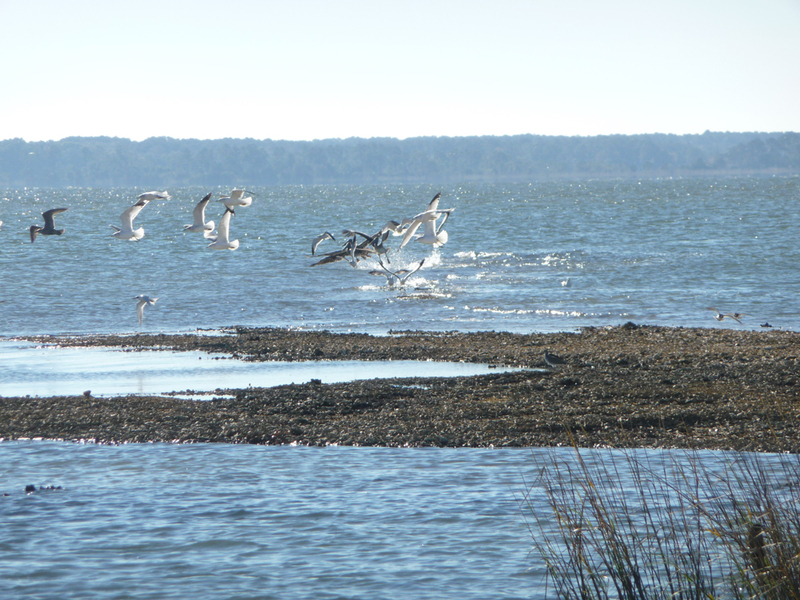 We decided to call it a day around noon and headed back to land. As we parted ways, Graham mentioned a few different ways of how to clean the fish (another thing that I had never done before), and I began immediately worrying about ruining the fish before I even got to the cooking stage. Cleaning was actually much easier than I thought, and after freezing the little guy overnight to prepare for the drive home, I began thinking in my head about what I was going to do with him. While living in Chicago, I had the pleasure of getting to know several people in the amazing Chicago culinary scene. I keep in touch with my good friend Mike, who is currently at Lula Cafe. He will often send me text messages of amazing looking things that Lula is putting out and when I bother him enough, sometimes he will hook me up with cryptic recipes that my untrained mind tries to decipher. It's a rare look into a professional kitchen and it's really exciting for me to see how things work. I had the opportunity to stage for just one day with Mike while he was sous chef at C-House in Chicago, and I learned more in that one day than I have in years of cooking on my own. About a month ago, he passed along a recipe for a stuffed Rainbow Trout that was on the menu at Lula, and I couldn't wait for the opportunity to try it out. Catching my Speckled Trout was such a perfect opportunity that I knew immediately that this is what I wanted to make. This recipe has several components so I will go through them one at a time, in the order that I prepared them. Melt 2 tbsp butter in a skillet on medium heat. Once melted, add the shallots and sage and saute for about 2 minutes. Add hard cider and bring to simmer. 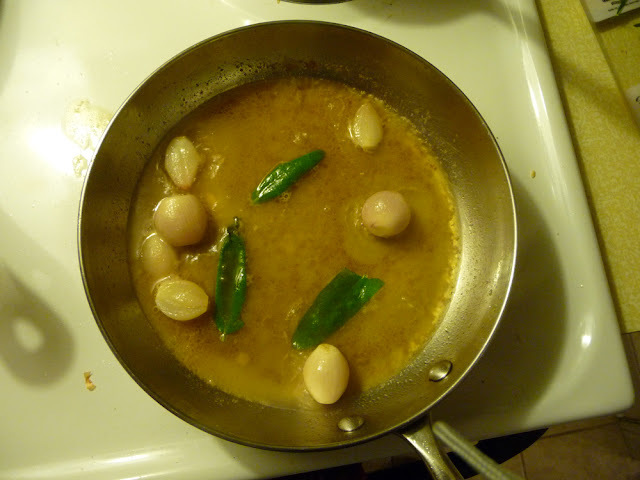 Turn heat down to slight simmer and braise shallots until liquid has reduced to a glaze, about 30 minutes. The onions should be very soft. Once glazed, remove from the glaze and set aside. Place lentils in a sauce pan with 1 celery stalk, 1/2 of a carrot, 1/2 of the onion, and a bay leaf. Cover with enough water to allow 3-4 inches between lentils and water surface. I didn't measure this - but I would say it was probably about 3 or 4 cups of water. Bring to a boil, reduce heat and simmer until lentils are soft but still have a solid consistency. They should retain their form. When they are done, pull out the mirepoix pieces and bay leaf, and then place a container under the strainer. You want to strain the cooking liquid from the lentils. 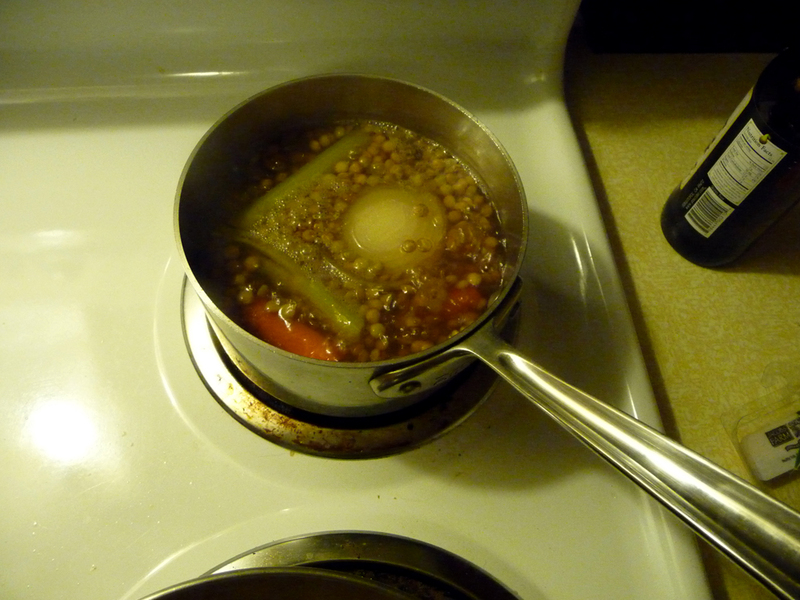 Put the lentils in a bowl and add about 1/2 c of the cooking liquid back to them and season to taste with salt. 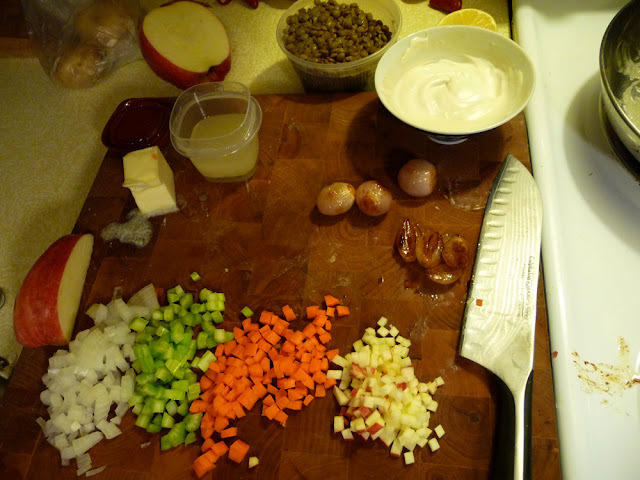 Finish the lentils by making a brunoise of the leftover carrot, celery, onion, and apple. Sweat in butter until the vegetables are just tender and mix them with the lentils. Brunoised vegetables and all the other mise en place ready for plating. Don't mind the mess, I was working at a feverish pace at this point. Start by pickling the crab. 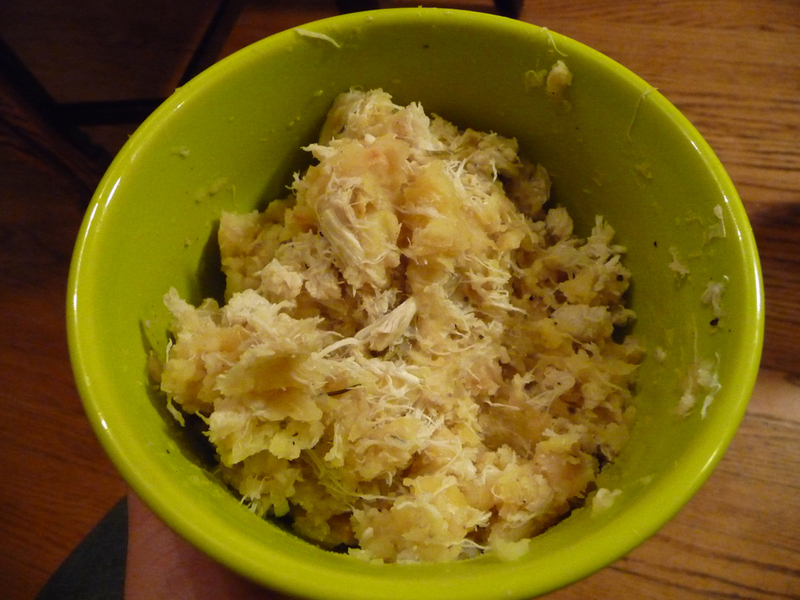 If the horseradish isn't already of a grated consistency, chop it up until it is pasty and then place it in a bowl with the crab meat. Add the vinegar and mix to combine. Let the crab sit for about 30 minutes. While it is pickling, peel the potatoes and apples and dice them evenly. Toss them with melted butter and a broken up sprig of rosemary and roast in a 350º oven for about 30 minutes, until the potatoes are soft. When they are done, pull them from the oven and smash them. Mix them with the pickled crab mixture and set aside. Take the sour cream and mash in the garlic. Add sherry vinegar and mix well. Pass the whole thing through a fine mesh strainer to mash and incorporate the garlic into a smooth consistency. Set aside. So this was interesting. I already mentioned that I had no idea how to clean a fish. I also had little to no idea how to scale the fish and prep it for stuffing. I have had a little experience with scaling, mostly of the annoying variety, when I buy fish from Whole Foods and it's not properly scaled and I have to clean it up myself. I used the back of a paring knife to brush off the scales in running water and then removed all of the fins with kitchen shears. Unfortunately, the fish wouldn't fit in a pan without removing the head, so I had to do that as well. I would have preferred to keep it on, but c'est la vie. I filled the cavity of the fish with the potato and crab mixture and then seasoned the fish well. Using a large cast iron skillet, I melted about half a stick of butter and heated it to medium high. 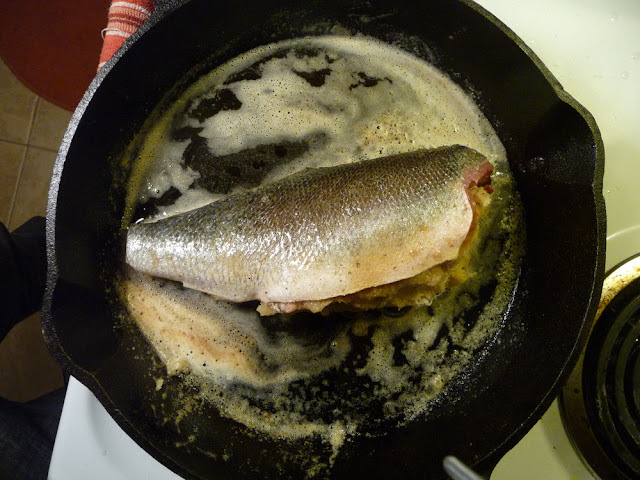 Carefully set the fish in the pan, being sure to keep the filling intact. Pan fry on each side for about 6 minutes, until the skin is brown and crispy. Continually baste as it fries. 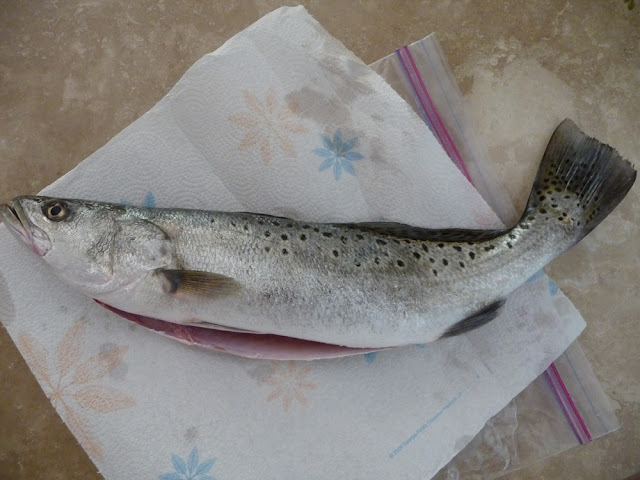 If you use Speckled Trout like I did, you may have to finish it in the oven to get it cooked all the way through. I just did it in the pan and it was still rare in parts. Plate by laying down the lentils on the plate. Place a couple of dollops of sour cream in front of them and lay the shallots on top of that. 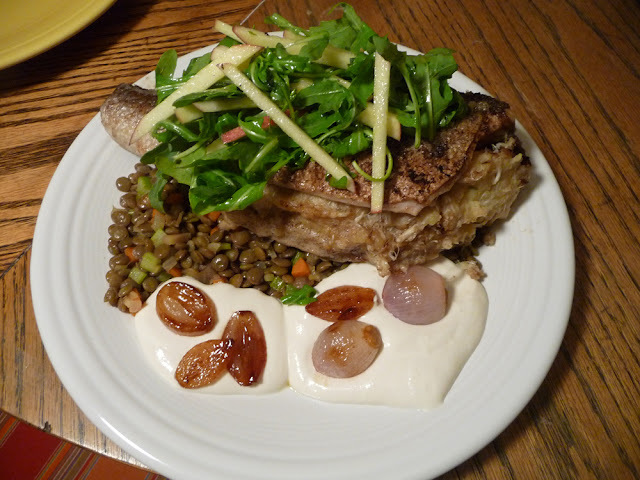 Lay the fish on top of the lentils and the salad on top of the fish. This plate was shared by my wife and I, it was a little messy to eat because the fish was so big but it looked really nice. If you use rainbow trout, you should have one plate per person. I remember reading about Native Americans in middle school and being really into Last of the Mohicans when it came out. 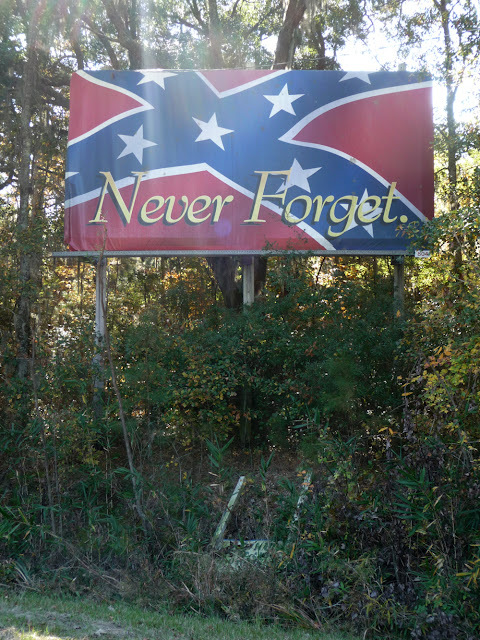 I thought people who lived off the land were completely unfuckwithable and I wanted to be like them. As I got older, I fell into lifestyles that still loosely tied into the mindset of self sustainability and it has stuck with me throughout my life. I got heavily involved in the DIY punk and metal scenes and became vegetarian, initially as somewhat of a challenge to myself during a very difficult summer in my life, and later on (as I became more educated on the matter) because I agreed with the ethical aspect of boycotting factory farms. I always believed in the food chain though, and I came to realize that it is possible to support ethical farming and be an omnivore. Americans are generally very out of touch with where their food comes from, and this is something that I want to change about myself. I want to know where my food comes from and accept the responsibility of knowing that sometimes I am eating something that was alive recently. This experience was my first real opportunity to go from the source of a food all the way to the table, and I am very grateful for that. I remember at one point reading about how Native Americans always thanked their food and showed it the utmost respect, as one animal would help an entire tribe for weeks. For some reason, as I was fishing and as I was preparing this meal, I kept thinking about that, and I hope that in the end I showed this little Speckled Trout the respect that it deserves. I think that I did.